Across the Catholic Parish of Guildford, there are lots of activities that can allow your child grow in faith and become closer to God. Responsibility and a way to develop their faith and serve the church. 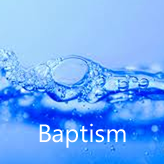 Baptism is the first of the Church’s Sacraments.